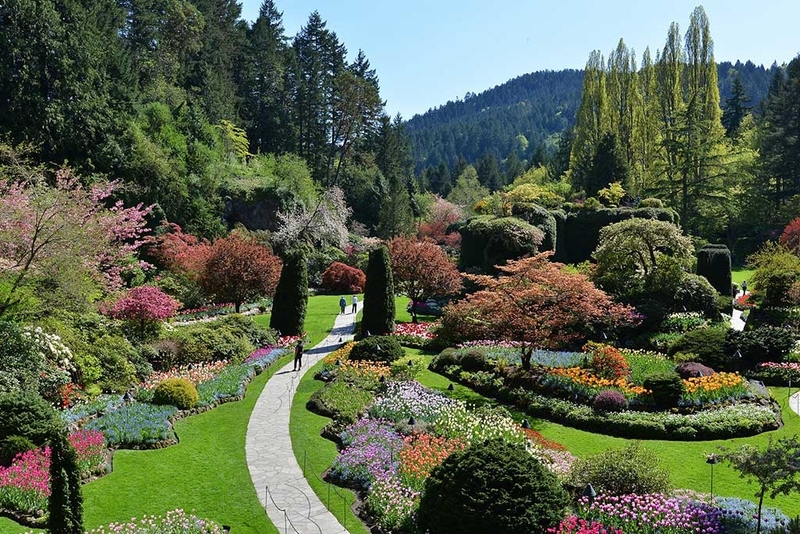 What reads as overt hyperbole quickly becomes reality when listening to remarks made by visitors strolling around the stunning spring floral splendor of world-renowned The Butchart Gardens. This time of year, The Gardens shift into overdrive. The sweet scent of hyacinths blanket the grounds. Fiery orange crocuses burst from the earth like a ball of flames. Overhead, showy clusters of pink crabapple blossoms cascade from the branches of nearby trees, adding to the display. To the casual observer, The Butchart Gardens are once again springing to life. However, behind the scenes, The Gardens are already a hive of activity. Greenhouse technicians have been busy propagating plants for the seasons ahead. Begonia seedlings are ready to make the journey from nursery container to display garden bed and Dahlia cuttings are taken in preparation for summer planting. After all, maintaining the awe-inspiring array of plants, flowers, shrubs and trees carpeting the five-acre grounds is no small feat and requires the creative minds and effort of more than 70 garden staff. Everyone on the team is plant crazy. We rely on the staff to bring in new plant varieties because all concept and design comes from within. We are always thinking about color schemes for planting changes. As the spring season ramps up, visitors reap the rewards of the 300,000 bulbs planted the previous fall. The blooms emerge with the warmth of the spring sunshine in a carefully curated explosion of brilliant pinks, oranges, yellows, violets and reds. As the bulbs push their green shoots toward the sky, the gardeners break up the hard, compact soil in their flower borders, allowing the air, water and nutrients the plants need to thrive to penetrate. The staff gauges their performance by the drama of the color pops they create and listen for “oohs” and “ahhs” as guests soak in a field brimming with blooms. These wow moments are what every gardener aims to produce for visitors both young and old. This is part of the magic of what we do. The basic structure and layout of the garden won’t change, but the team will change out shrubbery or perennials and most people won’t even know. Eighty percent of people will walk through and sense something is different, but won’t be sure what it is. She wouldn’t have wanted us to keep doing the same thing over and over again. She was always introducing plants from all over the world, which was unique at the time. I like to think we have the same mindset in this way, we carry forward her vision of change, without taking away the structure of the garden that she laid out. We see our designs as deeply rooted in the past, a part of today and thinking toward the future. Once the bulbs arrive in the fall, the physical challenge of three to four weeks of hard labor ensues. The bulbs are buried in the beds among The Gardens’ tens of thousands of perennials during a planting frenzy from early October to early November. The energy put into maintaining The Gardens is certainly well spent. There are few other parks or municipalities creating displays at the same level, making The Gardens an increasingly unique experience. How to Get to The Butchart Gardens…. Getting to The Butchart Gardens in Victoria, BC is about as easy as it gets. A less than three-hour ride on the Clipper from Seattle lands you in the heart of Victoria. From there, hop on the modern, double-decker motor coach waiting for you at the Clipper terminal. Immerse yourself in the city’s scenic beauty as your guide fills you in on the history of Victoria while you cruise by the city’s landmarks and historic buildings. A mere 30 minutes later, you’re at the gates of the world-famous gardens and ready to explore the 55-acre botanical masterpiece. Walk along intimate stone paths and streams lined with a colorful array of flowers and trees. Don’t miss the award-winning Butchart Dining Room’s Afternoon Tea service, surrounded by thousands of beautiful blooms, and unique house-made gelato flavors at the Gelateria Benvenuto (in the Italian Garden) come summer! Beautiful! Well done. We have been to the gardens twice but not in the spring. Glad to hear you liked the post! The Gardens are absolutely beautiful in the spring, you definitely should be sure to make the trip up. We’d love have you along with us! I call the garden “a piece of heaven” and never miss the chance to visit it, when in Victoria! it is a magical place with colors , shapes and aromas that feed your soul. I always appreciate the dedication and hard work of the staff to offer such a great kingdom of flowers! I wish I had my favourite flower but it is so hard to chose from the roses, tulips or dhalias… will be back soon maybe in the summer to watch the unique fireworks show! We would love to have you travel with us, please let me know if you have any questions. Are wheel chairs available to rent at the entrance? Great question! Wheelchairs are at the the entrance of The Butchart Gardens and are free of charge, but a refundable deposit of $10 is required. Please be aware that The Gardens have a limited number of wheelchairs to lend, and they are available on a first-come, first serve basis (no reservations). Escorts/assistants are not available to push wheelchairs. Only motorized or standard wheelchairs/personal mobility scooters are permitted. Due to the design and layout of the gardens, we are unable to accommodate Segways. Scooters may be rented with advance notice from Motion Specialties in Sidney or Victoria. I will be there late September what will the gardens be like then? Will there be enough color to enjoy? Great question! Yes, the Japanese garden boasts an abundance of color with the variety of maples in that section of the grounds changing to yellow, orange and red for the fall. Several of the deciduous trees throughout The Gardens will also be beginning to change color that time of year. There are also beautiful Dahlias in a range of colors blooming in the fall. Check out this blog post for information. Let me know if there is anything else I can help with.